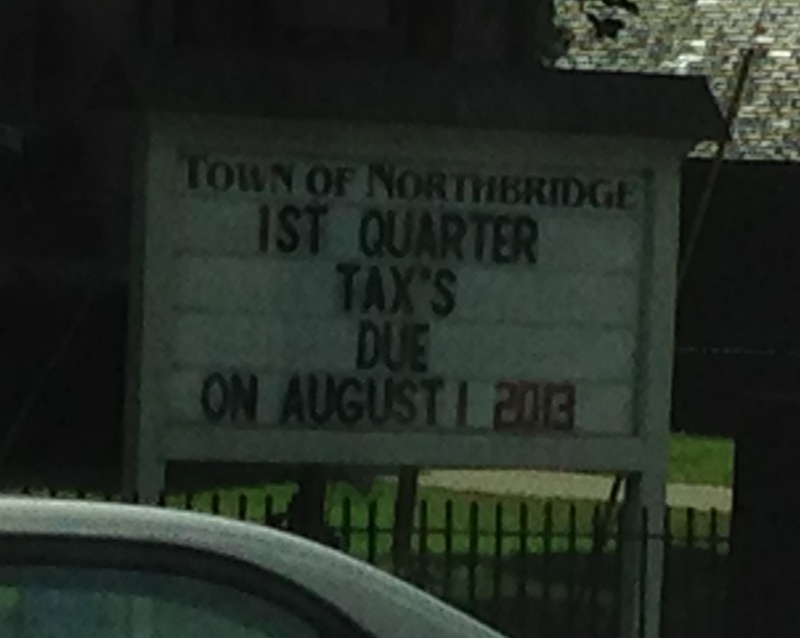 Today while I was driving, I noticed a sign advertising: “1ST QUARTER TAX’S DUE ON AUGUST 1 2013.” As usual, the unnecessary apostrophe (and the missing comma, but to a lesser degree) annoyed me, but then I rationalized it: it got the point across and I guess the same skill set isn’t really needed for doing taxes as advertising their deadlines. Because I was on a particularly boring road, I next thought about the comma, because it’s the same shape as the apostrophe (hence its new title, the “comm’apostrophe”). Instead of allowing us to be more concise, as the apostrophe does, the comma allows us to elaborate by creating lists or by adding dependent clauses, which can add a more formal element to a sentence (i.e., the sentence you just read). Neither of these marks is totally crucial for understanding a sentence, and we probably don’t notice their absence nearly as much as we’d notice a missing period or question mark. But they make communication richer and more fluid. For that reason (and at the risk of sounding like a prescriptive linguist), I really hope that their functionality is preserved as the English language continues to evolve. Or maybe I should just shut up and do my tax’s. Also I know I comment a lot about French/English comparisons… but I’m doin’ it again so just bear with me! The apostrophe helps make English so much more concise than French in certain situations. In English you can just say “Jane’s pencil” instead of “the pencil of Jane” (the word-for-word French translation equivalent). Think about how funny French would sound if they did have the possessive apostrophe! Pingback: Disparaged dialects have rules too | Whats in a brain?